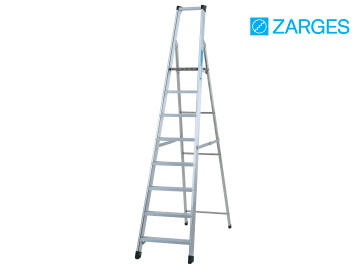 The Zarges Aluminium Industrial Steps provide a safe, yet light stepladder with a smooth handle surface. With a patented 7-point connection between tread and stile, and a reinforcing support rod through the centre of the tread. Rubber feet prevent slipping and large serrated treads improve safe standing. 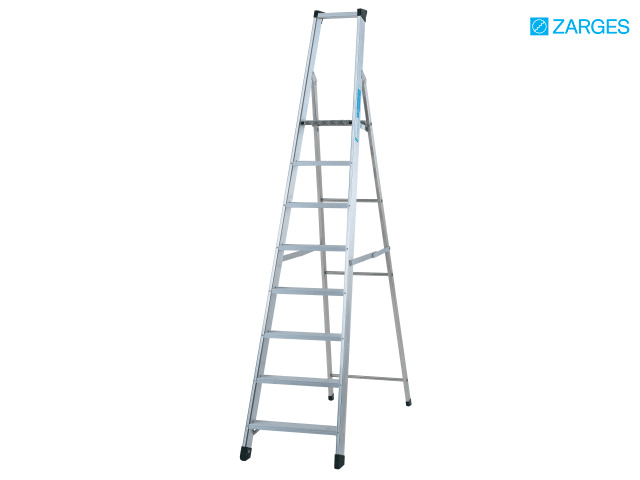 A large standing platform and knee rail provide safe and comfortable working at height. Smooth stile surfaces are comfortable to hold. Optimal stability is created from locking side bars on both sides. All sizes conform to EN 131 with a 150kg rating and BS 2037 Class 1 with a 175kg rating.